The most significant difference between the slip ring and split ring is that the slip ring uses for transferring the power between static and rotary part. Whereas, the split ring uses in DC machine for reversing the polarity of the current. The other differences between split ring and slip ring are represented below in the comparison chart. 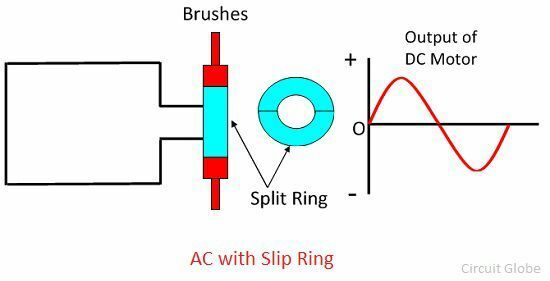 The slip ring and split ring both are made of copper, but their design differs from each other. The slip ring is a closed circular ring having brushes on their outer surface. In case of AC motor, the input current through the brush passes to slip ring which connects to the coil of the AC motor. Thus, the current flows from the static to the movable part. The split ring is made of copper and its split from the centre into two parts. The brushes connect across the outer diameter of the split ring. It is used in the DC motor for transferring the pulsating voltage. Definition The slip ring is used for transferring the power between the rotating and stationary structure of an AC machine The split ring is used for reversing the direction of current. Uses It is used in AC machine. It is used in DC machine. Design Continuous Ring The ring is split into two or more parts. Application It supplies power from an AC generator to the AC motor. For supplying pulsating voltage to the DC motor. The slip ring is a part of an AC motor use for transmission the energy between the stationary and rotating element of the machine. The graphite material uses for the manufacturing of brushes. It places on the outer surface of the slip ring. The current through the brush passes to slip ring. The slip ring connects to the coil of the motor for transferring the energy. It is available in different sizes. The slip ring has various other names like collector ring, rotary electrical ring, etc. The split ring is a movable device used for reversing the polarity of the current. It is made of copper. The ring divides from the centre into two halves. The combination of the split ring and brushes is known as the commutator. The split ring uses in DC motor for getting the pulsating input voltage. The slip ring use for transferring the power from static and rotary part of the machine. And the split ring uses for changing the polarity of the current. The slip ring is used in AC machine, whereas the split ring uses in the DC machine. The slip ring is in the form of the continuous ring, and the split ring splits into two or more parts. The slip ring collects the power from DC generator through the static devices called brushes and then pass the current to the slip ring. The slip ring connects to the coils of the motor. Hence, the power transfer from static to the rotary part of the component. Whereas, the split ring uses for changing the polarity of the current. The Slip ring and Split ring constructs from the same metal called copper, but their designs are different. The slip ring is in the form of the circular ring, and the split ring has an air gap between them. The slip ring transfers the current between the static and rotary part and the split ring reverse the polarity of the current.